Some of the best stories are those that leave much to the reader’s imagination – at least to me they are. That’s exactly what Lewis has tapped into with Patron. As a teen, I was fascinated by mythology: Greek, Roman, and even some Norse for flavor – it’s not really surprising that Chris Hemsworth became one of my favorite actors simply because of his role as Thor. So upon reading the blurb for Patron, I couldn’t wait to get my hands on it. The mere suggestion that Theodore might find himself face-to-face with an ancient god, all in the search for a patron for his studies… well, there was no way I was passing that up, especially as this is a m/m historical romance. And Lewis did not disappoint. For those readers looking for between-the-sheets action, this is not the book for you. Theodore is a student of Greek literature and is hoping that an invitation to read a passage from the Iliad, in its original Greek, will open up avenues of study and access to collections that his lower social class does not allow. It is in a moment of weakness… folly… desperation… or perhaps acknowledgement of the gods he actually believes in (rather than the god he is expected to believe in) that he makes an offering and a plea to Hermes, patron of oratory and good luck, for his reading to go well. It goes spectacularly and Theodore soon finds himself with more invitations than he ever dreamed of, but there is one invitation that was more than he hoped for but was exactly what he wanted, and it is in the course of utilizing that particular invite that Theodore learns just how lacking his education has been – but not because of his social class, rather because of the Church’s hand in teaching abridged copies of the classic Greek texts. The more he reads and translates from the complete texts, the more his past inclinations are revived and he finds it harder and harder to deny them in light of Alexander’s attention – especially when Alexander intimates that he is receptive to Theodore. I found Patron to be a rather seductive read. Theodore’s passion for Greek literature and mythology is conveyed so well that I was easily caught up in his excitement, his anticipation, and his worry over the discoveries he made. That it went hand in hand with his growing attraction to Alexander and his internal struggle over whether or not he could accept what Alexander was offering made it impossible for me not to be swept along with him. I felt myself being seduced by Alexander’s illicit proposal and during the final scene in the book, I was probably panting just as hard as Theodore was as the lines between reality and mythology were blurred. And while my immediate reaction when I got to the end of the story was, “NOOOOOOOOOO!”, I cannot convey how much I appreciated that the author left it where she did, allowing me to use my imagination for what comes next, because quite honestly, the ending was perfect. 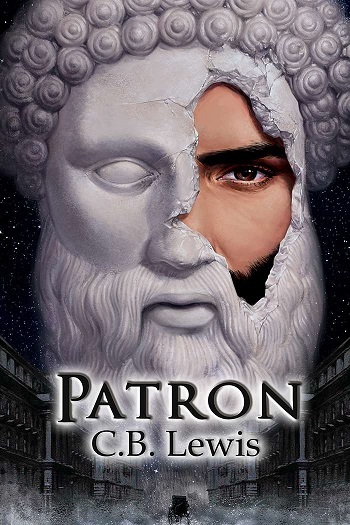 Reviewers on the Wicked Reads Review Team were provided a free copy of Patron by C.B. Lewis to read and review.